Academies from the UAE have been touring Australia to get used to playing on different wickets. Dubai: Ebrahim Alam cracked an unbeaten century while Rhean Alaric produced a deadly five-wicket spell in the Young Talent Cricket Academy’s (YTCA) tour of Australia. Cricket academies from the UAE have been touring Australia to get used to playing on different wickets. Desert Cubs Cricket Academy too had just concluded a tour of Australia recently. 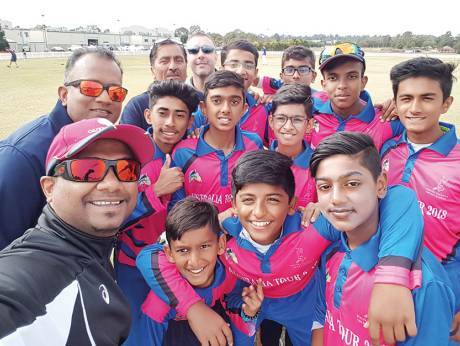 YTCA youngsters toured Queensland with their founder and head coach and former UAE World Cup player Shahzad Altaf, director and Cricket Australia Level II coach Mahesh Fonseka and another head coach and Cricket Australia Level II coach Virosh Fernando. The teams were made up of two age groups — Under-16 and Under-20. Alam cracked an unbeaten 104 against Walston Park junior team. while Alaric wrecked Bizzy Lankans with a spell of 5 for 20. Panjika Piyasiri too would have become the second century-maker of the tour, but fell for 99 against Queensland Rohingya Strikers. He also hit an unbeaten 74 against Bizzy Lankans. The other star performers of the tour included Cherian George who hit two unbeaten knocks. He cracked an unbeaten 56 against Coomera Hope Island Cricket Club and also scored an unbeaten 77 against Walston Park Cricket Junior Team. Isra Ahmad too cracked an unbeaten 61 against Queensland Rohingya Strikers. During the tour, the youngsters trained at the famous Bupa National Cricket Centre, affiliated with Cricket Australia. They also had mid tour training sessions with first class coach Terry Oliver.